In the previous post on New York Court Watcher, we looked at 10 decisional highlights of the Supreme Court's last term. (See Supreme Court: Highlights, Patterns & Implications from Last Term (Part 1), Sept. 29, 2010.) As explained in that post, these are the decisions that seemed particularly important, politically and ideologically charged, and, consequently, particularly revealing. The number 10 was purely fortuitous. An unintended "Top Ten." This past Monday--the first Monday in October--was the beginning of the Court's new term. So this seems a good time to take stock of what the Court and its Justices did in the immediately preceding term, and, in that way, to get a sense of where they've been, where they are, and where they're going. In the next several posts, we'll take a closer look at the decisional highlights identified in the last post. We'll start by looking at those decisions involving issues of free speech and closely related matters. There are 4 of these among the highlights. They deal with speech, association, and open government. 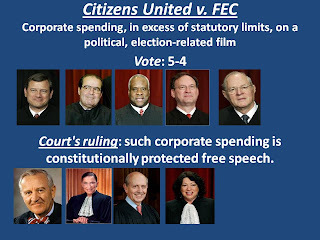 In Citizens United, the Court was faced with a conflict between corporate political activity (funding an anti-Hillary Clinton film) and federal campaign finance reform legislation (the McCain-Feingold law). 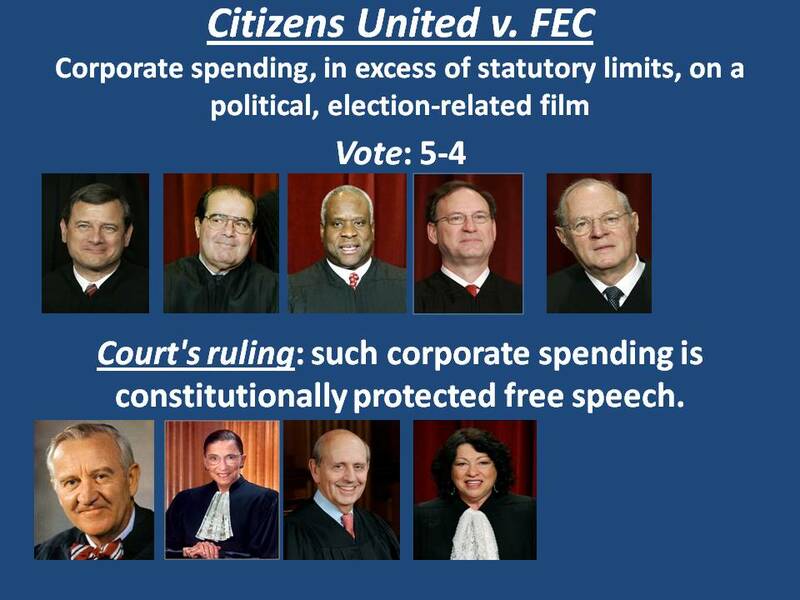 The Court--i.e., a 5-4 majority--sided with the corporate activity. The Court divided along strict ideological lines. The 4 conservative Justices versus the 4 liberals. The Court's conservative bloc--Chief Justice John Roberts (Bush II appointee), and Justices Antonin Scalia (Reagan), Clarence Thomas (Bush I), and Samuel Alito (Bush II)--was on one side. On the other was the liberal bloc--Justices John Paul Stevens (Ford), Ruth Bader Ginsburg (Clinton), Stephen Breyer (Clinton), and Sonia Sotomayor (Obama). The 4-4 tie was broken by the Court's moderate-conservative "swing-vote," Justice Anthony Kennedy (Reagan), who was with the conservatives in Citizens United. So, the 4 conservatives, plus Kennedy, favored the corporate political activity. The 4 liberals supported the restrictions in the campaign finance law. From a purely political perspective, the voting was precisely what one would have predicted. The conservative Justices voted like Republican politicians; the liberals like Democrats. But then there's the judicial activism versus judicial restraint angle. If you take seriously what the politicians say--and some pontificating Justices too--you'd be very surprised. Take activism. For example, overriding the choices of the other branches of government, the ones that are elected--i.e., the Congress and the President. The conservative Justices [The restraintists?] did just that. They invalidated campaign finance legislation passed by Congress and signed by the President. Legislation that was not clearly unconstitutional--the standard that conservative "restraintists" always insist is the proper one before invalidating a law. Another aspect of activism: loosely interpreting the Constitution. The conservatives did that as well. First Amendment free speech protects not only persons, but now corporations as well. And more than that, "speech" includes not just talking and its equivalent, such as signing, but spending funds to pay for a film. Yes, to be sure, a political film. And yes, that is activity for the purpose of expressing an opinion. But it is spending, not speech; it's supporting expression or expressive activity, not speech. Lots of activities have expressive content and are engaged in to express an opinion. But they are activities, conduct. They are physical, not verbal. Conduct versus pure speech. That is a traditional divide. It's what separates criticizing the government from burning the flag or a draft card, rioting, destroying government property, and other activity intended to express discontent. The former is pure speech and virtually always protected by the First Amendment. The latter, on the other hand, is conduct--expressive, but still conduct--and much more susceptible to restrictions without offending the Constitution. Only a loose, expansive interpretation of "speech" would include corporate spending to pay for a film. "Loose" or "expansive" interpretation of rights is what conservative "retsraintists"--Justices and politicians--condemn. But that is precisely what the conservative Justices engaged in. As for the liberal Justices, they were suddenly restraintists in Citizens United. In that case, it became very important to respect the choice made by the other branches. And it was suddenly compelling to give a strict, narrow ruling to First Amendment free speech. Or at least to subordinate it to campaign finance reform. So free speech only for individual persons, not their organizations? At least not if those organizations are incorporated? And spending to express a political opinion is too far afield from speech itself to warrant constitutional protection? Well now, the liberal Justices sort of sounded like the conservative Justices and politicians advocating "strict interpretation." Bottom line: the conservative Justices "interpreted" the Constitution the way they criticize the liberals for doing. Vice versa for the liberals. On the other hand, the conservative and liberal Justices did vote, respectively, just like political conservatives and liberals. It's a familiar story. Political, philosophical values typically trump an avowed interpretive methodology. Now that we've elaborated on a couple of themes, let's deal with the other highlight cases with these in mind. The Court again confronted a conflict involving free speech in Humanitarian Law Project. This time it was the "war on terror" that was the competitor. On the one side was a human rights group teaching about international human rights and about non-violent political advocacy. On the other side was the federal law prohibiting "material support" of any kind to a "designated foreign terrorist organization." The humanitarian group gave instruction to 2 such organizations. All 4 conservative Justices--Roberts, Scalia, Thomas and Alito--rejected the claim that free speech, even speech regarding non-terrorist matters, had to be excepted from the law's prohibition. The conservative bloc was joined by swing-vote Justice Kennedy and, somewhat surprisingly, liberal Justice Stevens. Only somewhat surprisingly because Stevens often shows a considerable deference to the government in foreign matters. Additionally, Stevens was likely appeased by Chief Justice Roberts's majority opinion. It emphasized that the government had to show a compelling interest in order to curb speech, even in the "war on terror." Three of the liberal Justices--Ginsburg, Breyer and Sotomayor--dissented. For them, there was no justification to curb free speech under the law unless the speech was advocating terrorism or actually supporting terrorist activities. So, the conservative Justices, who went out of their way to support the free speech rights of corporations to spend money on a political film (in Citizens United), were less sympathetic to a humanitarian group advocating human rights and peaceful political change. Those Justices invalidated a law that targeted corporate spending. But they were unwilling to carve an exception in another law for pure speech by a human rights group. "Activists" in one case; "restraintists" in the other. The liberal Justices, on the other hand, were more than willing to subordinate expressive political activity to very debatable campaign finance reform (in Citizens United). But they (minus Stevens) were unwilling to curb expressive activity in the government's efforts to fight international terrorism. Those Justices would uphold a law restricting domestic political activity, but would curtail a law restricting activity with foreign terrorists. "Restraint" in one case; "activism" in the other. Yes, there are good arguments--as well as bad ones--for the positions taken by the conservative Justices in both cases. Same for the positions of the liberals. And yes, that's typically the way it is with cases before the Supreme Court. Especially these highly charged cases. That's one of the very reasons the cases are highly charged. That being said, what can hardly be gainsaid [Always liked that word, no doubt for some odd reason, when "denied" would do just fine.] is that the conservative Justices don't always defer to the judgments of the other branches. That is, the other, more accountable, more democratic (with a small "D"), elected, more representative branches. The conservative Justices are not above substituting their own judgments for that of the other branches, even in close cases. Even when the law passed by Congress and signed by the President is arguably constitutional. They are not above invalidating a law whose constitutionality is a close call. Exactly what they and conservative politicians decry as illegitimate judicial activism. Yes, that's what they did when they invalidated the restrictions on corporate political spending at issue in Citizens United. It was a close call, but they didn't give Congress and the President the benefit of the doubt. And the liberal Justices are just as ready to suddenly adopt the mantra of judicial restraint. Congress passed the law, the President signed it, the Court should respect their judgments. Well, that is, at least when the laws enacted reflect politically liberal values, interests, and policies. Like campaign finance reform. Like curbing corporate influence. Then judicial restraint. Something else that cannot be gainsaid: the conservative Justices are not always "strict constructionists," sticking to the text of the Constitution and to its original meaning. Spending to fund a film, by a corporation, is hardly free speech within the strict text or original meaning of the First Amendment. Only a very expansive interpretation of free speech can get to corporate political spending. That's the kind of interpretation supposedly antithetical to conservative Justices and politicians. But that's exactly the kind of interpretation employed by the conservative Justices in Citizens United. And the liberal Justices are not always opposed to "strict construction." Well, not when strict construction of the First Amendment would help deny constitutional protection to disfavored corporate political activity. No, they are ready to adopt a literalistic and cramped reading of free speech in order to support restrictions on activity that is expressive, political, and part of the election process--but engaged in by persons joined in a corporate entity. When it comes to a law that limits the activities of a human rights group, however, the roles are reversed. In Humanitarian Law Project, the conservative Justices were back to deferring to the other branches and limiting the freedom of speech. In that case, it was a liberal internationalist group, not an American corporation, that was seeking free speech protection. And the law at issue was part of the "war on terror," not some liberal campaign finance reform. 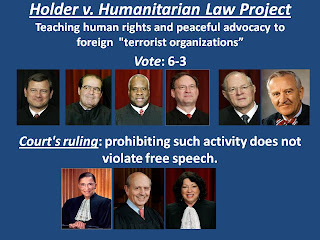 So while Citizens United was about corporation "speech" versus campaign finance reform, Humanitarian Law Project was about a liberal human rights group's speech versus the "war on terror." It's not difficult to see where the sympathies of conservatives--Justices as well as politicians--would lie in the two cases. 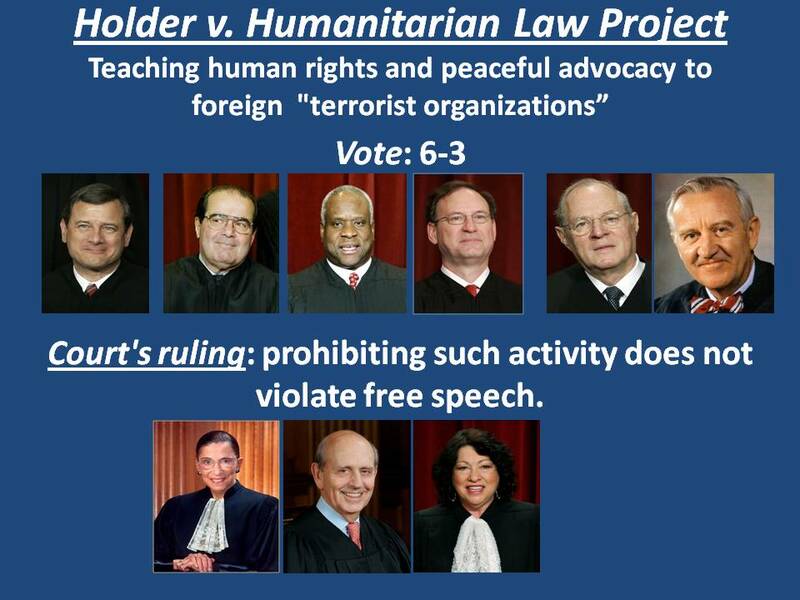 Likewise, it's not difficult to see why conservatives--Justices as well as politicians--sided with free speech in Citizens United, but not in Humanitarian Law Project. As for the liberals--Justices as well as politicians--it's just the reverse. Corporate "speech," no. Campaign finance reform, yes. Liberal human rights group's speech, yes. "War on terror" restrictions, no--at least not on speech. Forget activism and restraint, loose and strict interpretation, deference or not to the other branches. In Citizens United and Humanitarian Law Project--as in most of the close, highly charged cases--it's ideology, political philosophy that usually determines the Justices' votes and, ultimately, the Court's decisions. "Just apply the law!" That only begs the question in these cases. The law is either indeterminate, or there's law on both sides, or there's no law on point. That's why ideology and political philosophy tip the scales in these cases. That's just another way of saying that the Justices' views on Law, on a free society, on the necessary balance between government and authority, between order and liberty, etc., ultimately determine their votes in these difficult cases. In the next post, we'll look at 2 more such cases. These are the 2 other cases among last term's highlights dealing with free speech and related matters. Following that, we'll have a few graphs to help visualize what the Court decided and how the Justices voted--i.e., how they behaved in these cases. Then, in the next several posts, we'll do the same for other categories of cases, including criminal law and church and state.